Christmas German Pyramid Painted Figurine 4 Level . Gold accents abound in this four level Christmas pyramid with three rotating tiers on the candleholders on the columns and even on the paddle blades themselves! This attention to detail is what makes something go from beautiful to spectacular. Set on a background of white the color figures of the Holy Story stand out with Mary and Joseph and the Baby Jesus with an angel nearby and the shepherds with their flocks on the lower moving tier then above them are the Holy Family fleeing with the angel to protect them and the wisemen giving them the gifts that will help them on their way on the third moving tier are the soldiers with spears drawn ready to search for the Baby King and on the top stationary level are the triumphant angels chorusing praises under the stars that are on the spinning blades. 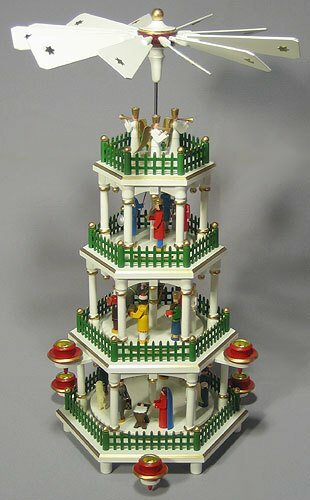 This spectacular Christmas German Pyramid Painted Figurine 4 Level stands about 18 1/2 inches tall and requires 6 medium candles to turn. Made in the Erzgebirge Mountain region of Germany in the village of Seiffen. Handmade by the Artisan Coop. With our German Pyramids - Charming memories unfold as you watch the delight in the eyes of the children both young and old.